I arrived at the Bud Collins USTA Media Center on Wednesday morning to cloudless skies, and in just a few hours around the grounds, I saw something I hadn’t seen in six days in Cincinnati a week before–a sun burn. It almost felt good, felt like summer tennis. It was Round 1 qualies time at the US Open, and you know what that means–you get to see sad veterans, ebullient up-and-comers and players you’ve simply never heard of. Court 17 was the All-American court on Wednesday, as Americans were scheduled in all 5 matches. UVa’s Ryan Shane won a three-setter against Kimmer Coppejans, and he was in fantastic spirits after the matches and quite popular with the selfie circuit. Sacha Vickery and Tommy Paul were unsuccessful on the court in their matches, so when Reilly Opelka prevailed over Edouard Roger-Vasselin, we knew the US was guaranteed a winning record on Court 17 as the final match was scheduled between Carolyn Dolehide and Melanie Oudin. Oudin was the final victor on everyone’s favorite outer court on Wednesday. Shane will play Belarus’ Ilya Ivashka on Court 5 today, which is the Court Americain Du Jour, as your line-up there includes our stateside contingent of Amanda Anisimova, Jesse Pegula, Oudin, Opelka and Shane. You had Stefan Kozlov lose a 12-minute game in a third set, which was a harbinger of his loss against Michael Berrer, and you had this guy, Adrian Menendez-Maceiras, act like he had won a grand slam just by prevailing in his first round qualifying match. On a final note, Usue Arconada won her first US Open qualifying match in her second attempt, 3-6, 6-3, 6-3 over Yu-Hsuan Lee. Arconada, the 2016 Wimbledon girls doubles champion showed poise throughout. She’ll take on Sara Sorribes Tormo later today. CHARLOTTESVILLE, Va., April 30, 2015 – Mother Nature cut things a tad short during Thursday’s round at the 14th Annual Boyd Tinsley Women’s Clay Court Classic, the USTA Pro Circuit event being held this week at the Boar’s Head Sports Club. Rain began to fall in the afternoon, cutting a few matches short. The matches are scheduled to be resumed on Friday. Seven of the eight singles second-round matches were completed, with only one seeded competitor remaining heading into the quarterfinals. No. 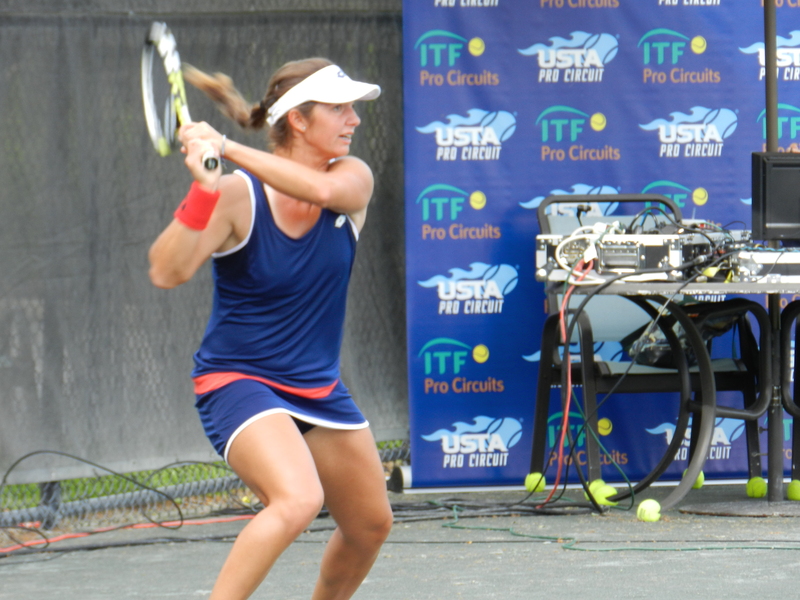 3 seed Michelle Larcher de Brito of Portugal took care of American Caitlin Whoriskey, 6-4, 6-3. The other seeded player that made it through to the second round, No. 6 Paula Ormaechea, was knocked off by fellow Argentinean Florencia Molinero, 6-3, 7-5, on Thursday. Molinero will next face Usue Maitane Arconada, who defeated fellow American Julia Boserup, 6-7(2), 7-5, 6-2. Larcher de Brito, ranked No. 133, will await the winner between American Jessica Pegula and the lone qualifier still standing, Ukraine’s Elizaveta Ianchuk. Their match was suspended due to weather midway through the deciding third set, tied at 3 games apiece. 2013 Tinsley singles runner-up Allie Kiick survived a tough Thursday challenge from Brazilian Paula Cristina Goncalves, 6-4, 3-6, 6-4. Up next for Kiick is a quarterfinal matchup against Russia’s Irina Khromacheva, who outlasted Brazil’s Gabriela Ce in three sets on Thursday. The other singles quarterfinal matchup pits Katerina Stewart of the United States against Canadian Francoise Abanda. Each eliminated a qualifier on Thursday, as Stewart downed American teenager Nicole Frenkel and Abanda bested Storm Sanders of Australia. Only one doubles quarterfinal match was completed on Thursday, as second-seeded Chieh-Yu Hsu of Taiwan and Justyna Jegiolka of Poland ended the run of Americans Louisa Chirico and Grace Min, 6-2, 6-4. Hsu and Jegiolka needed just two points to clinch the match, but first had to wait out a 30-minute lightning delay. The match between Samantha Crawford & Emily Harman and Ce & Jessica Moore was suspended in the second set and is scheduled to resume on Friday. The other two doubles quarterfinal matches did not get started on Thursday, as play was officially called at around 4:15 PM. On Friday, Abanda and Stewart will kick things off on Stadium Court at 10AM (weather pending), with Larcher de Brito’s match to follow after appropriate rest for the winner between Pegula and Ianchuk. That match will resume at 10AM on Court 7 before Arconado and Molinero take the court. Kiick faces Khromacheva in the first match on Court 1, with the three remaining doubles quarterfinal matches to follow later in the day on Courts 1 and 3. Please see below for Friday’s complete schedule and full results from Thursday. The 14th Annual Boyd Tinsley Women’s Clay Court Classic features 32 singles players and a 16-team doubles field. The tournament is held at Boar’s Head Sports Club, 200 Wellington Drive in Charlottesville, Virginia. Admission to the tournament is free and the event is open to the public. 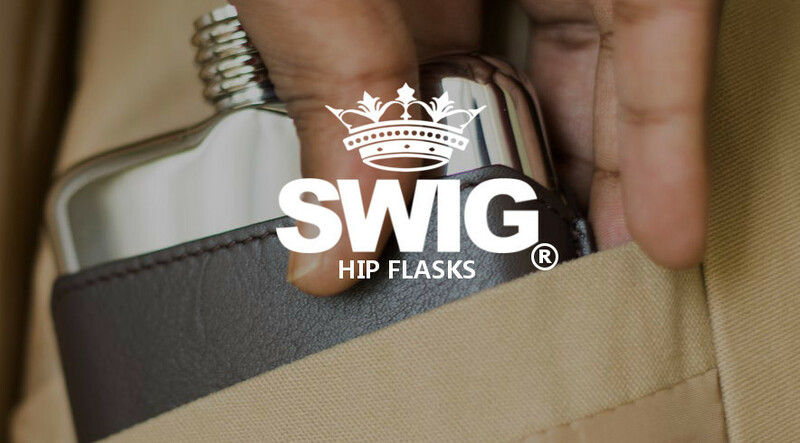 This year’s event will again be included in the three-week Har-Tru Wild Card Challenge, which awards one American man and one American woman a wild card into the main draw of the 2015 French Open, which begins in late May. Points will be added to the top American finishers in Charlottesville’s tally, with next week’s tournament in Indian Harbour, Florida marking the last chance to earn points toward the French Open. Again this year, the Boyd Tinsley Classic will be streamed live at http://www.procircuit.usta.com. 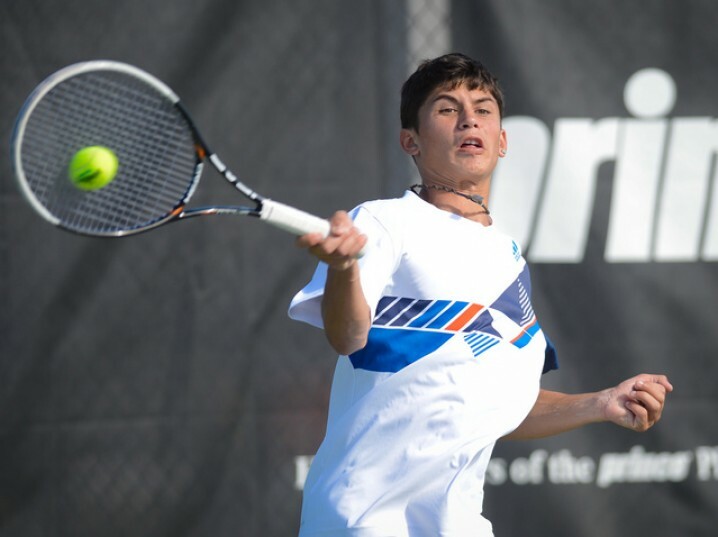 With more than 90 tournaments throughout the country and prize money ranging from $10,000 to $100,000, the USTA Pro Circuit is the pathway to the US Open and tour-level competition for aspiring tennis players and a frequent battleground for established professionals. Last year, more than 1,000 men and women from more than 70 countries competed on the USTA Pro Circuit for approximately $3.2 million in prize money and valuable ATP World Tour and Sony Ericsson WTA Tour ranking points. Jessica Pegula, United States vs. Elizaveta Ianchuk, Ukraine, susp. Samantha Crawford, United States / Emily J. Harman, United States vs. Gabriela Ce, Brazil / Jessica Moore, Australia, susp. Paula Cristina Goncalves, Brazil / Florencia Molinero, Argentina  vs. Francoise Abanda, Canada / Maria Sanchez, United States, ppd. Olga Ianchuk, Ukraine / Irina Khromacheva, Russia  vs. Jacqueline Cako, United States / Vojislava Lukic, Serbia, ppd. Posted in: ATP, Citi Open, Junior Tennis, Junior Tennis Champions Center, USTA, Washington, Wild Card Playoffs, WTA. Tagged: 2014, atp, Challenge, Citi Open, francis tiafoe, Jeff Newman, junior tennis champions center, Mats Wilander, qualifying, Ray Benton, tennis, Usue Arconada, wild card, wta. 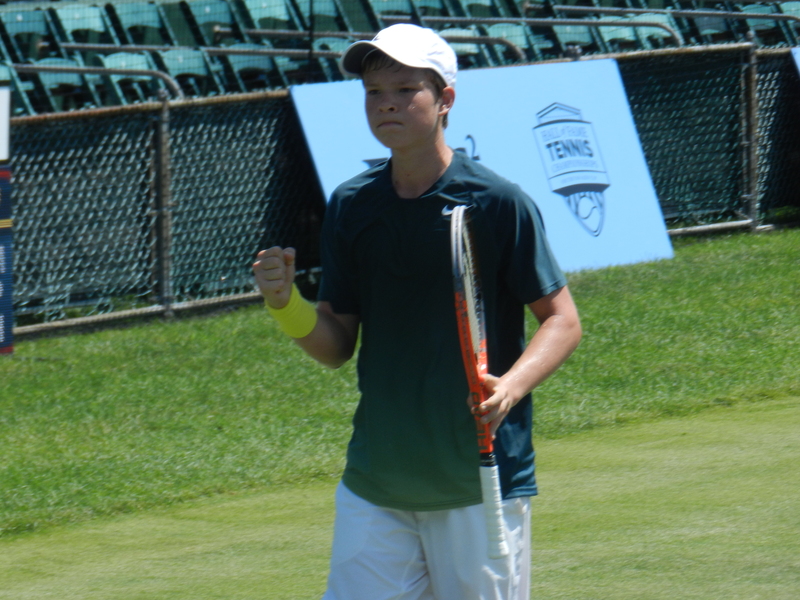 It hit 90° at the Junior Tennis Champions Center in College Park, Maryland yesterday. That was fitting, because it was Citi Open Weather. The Citi Open is held in late July-early August just 10 miles away at Rock Creek Park in Washington, DC. The Citi Open Wild Card Challenge will be staged here at the Center in College Park from June 14-17. The facility has already earned a USTA award as an outstanding venue and is finally getting the credit it deserves for cultivating champions, as the name suggests. The Wild Card Challenge will result in the winners advancing to the qualifying draws of the Citi Open, an ATP 500 level and WTA International level event. Yesterday, two of the centers protégés and seven-time grand slam champ Mats Wilander spoke about the event. 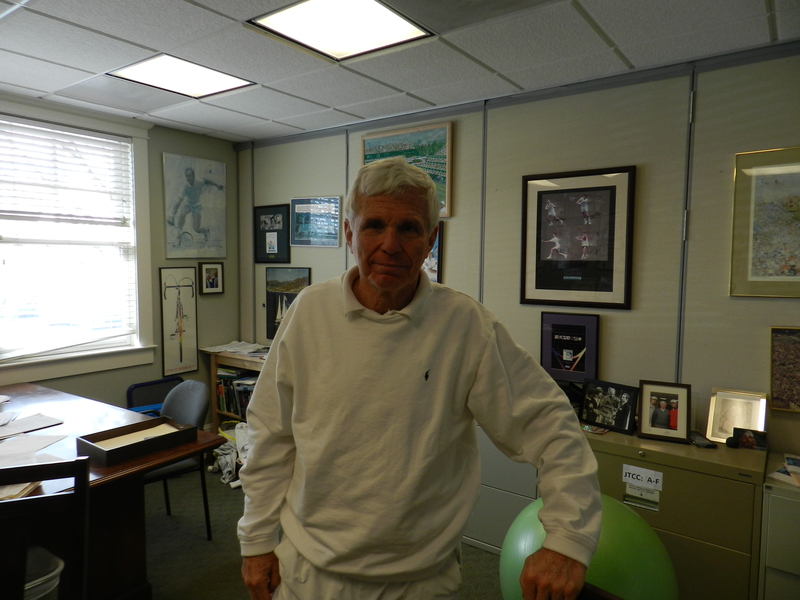 JTCC CEO Ray Benton and Citi Open tournament director Jeff Newman also discussed the genesis and planning of the event. It was the brainchild of Benton, who wanted to return to the Wild Card event that the Legg Mason Tennis Classic had employed almost 20 years ago. Newman also said the Citi Open will be more player-friendly than ever this year. The Challenge is open to all USTA players 14 and up. There is a registration fee of $75, but participants who enter this event and the US Open National Playoffs will receive a discount. The Challenge is two weeks after the USONP Playoffs and the Mid-Atlantic portion of the USONP competition will also be decided on the same courts here in College Park. For players already training for the USONP, this is a mighty second chance sweepstakes. In fact, the Challenge offers a big prize of its own. At the USONP, you have to win your sectional tournament and then you go to New Haven to battle it out for a spot in the US Open qualies. At the Challenge, you win out in College Park and you’re in Citi Open qualies. For some locals, myself included, playing at Citi Open on the hard courts beats driving by Flushing Meadows to go to New Haven to hope to get to Flushing Meadows. Having grown up (literally) at the JTCC, you would think Tiafoe is a lock. Instead, he is guardedly optimistic. Surprisingly, Tiafoe says his life hasn’t really changed since he arrived to conquer the ITF scene. Usue Arconada is ‘excited’ to play in the Wild Card Challenge. Last year, she was granted a qualifying wild card by Citi Open officials and more than earned her keep in winning her first WTA match in straight sets. Like Tiafoe, Arconada is another heavy favorite at the Wild Card Challenge. “I train here every day, so I know these courts pretty well”, she said. What a bonus it was to chat with Mats Wilander yesterday. Mats has rolled out Wilander on Wheels for a fourth summer. He travels by RV across the US (and Europe), appearing at dozens of tennis clubs. Posted in: Australian Open, Junior Tennis, USTA. Tagged: australian open, junior champions tennis center, Michael Mmoh, stefan kozlov, usta, Usue Arconada. 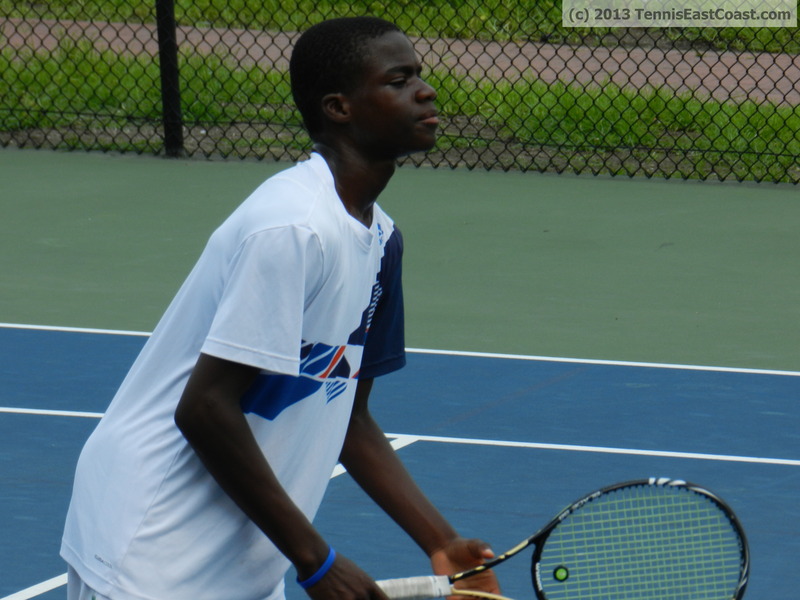 WHITE PLAINS, N.Y., January 2, 2014 – Stefan Kozlov and Michael Mmoh – two 15 year olds ranked among the Top 10 juniors in the world – will headline the Americans playing in the Australian Open Junior Championships January 18-25 in Melbourne. 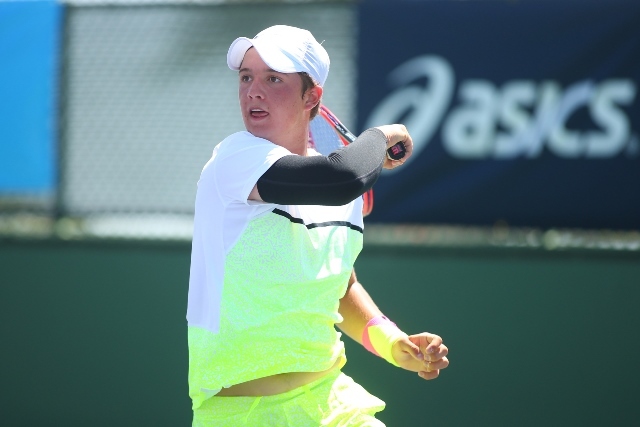 While many American teens will begin the year playing clay events on the USTA Pro Circuit, No. 5 Kozlov (Pembroke Pines, Fla.) and No. 9 Mmoh (Temple Hills, Md. ), who turns 16 on January 10, will attempt to follow Andy Roddick (2000) and Donald Young (2005) as Australian Open boys’ singles champions. They are the only two American boys entered into the main draw in Melbourne. Katrine Steffensen (17, Scarsdale, N.Y.) leads the Americans in the girls’ singles main draw. Michaela Gordon (14, Los Altos Hills, Calif.), Usue Arconada (15, College Park, Md.) and CiCi Bellis (14, Atherton, Calif.) were also accepted. Taylor Townsend (2012) and Kim Kessaris (1989) are the only Americans to win the Australian Open girls’ singles title, while Lindsay Davenport (1992) was a finalist. Six girls are entered into qualifying: Olivia Hauger (16, Tulsa, Okla.), Mira Ruder-Hook (17, Denver), Chloe Michele Ouellet-Pizer (16, Chapel Hill, N.C.), Raquel Pedraza (15, Claremont, Calif.), Meghan Kelley (16, Falmouth, Maine) and Ally Miller-Krasilnikov (16, Boca Raton, Fla.). Taylor Fritz (16, Rancho Santa Fe, Calif.) and Ulises Blanch (15, Pompano Beach, Fla.) are entered into boys’ qualifying.